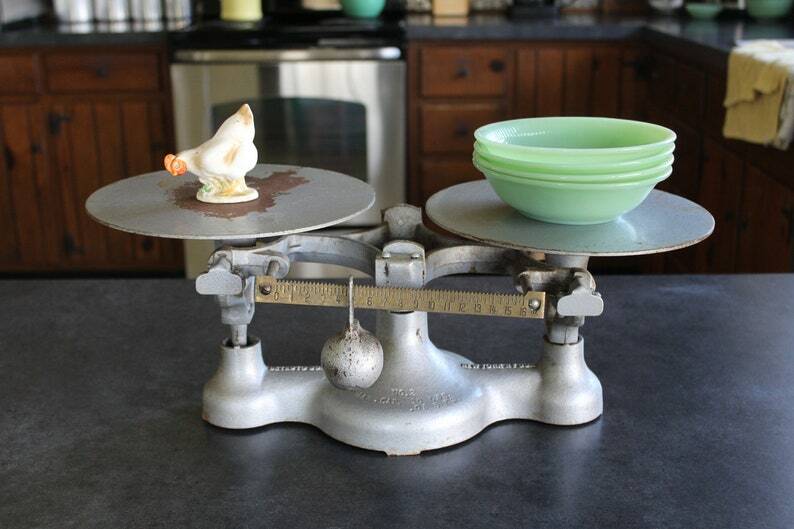 This vintage cast iron scale is a #2 Detecto scale with a maximum capacity of 10 lbs. It is silver or grey with a brass ruler and cast iron ball weight. It was made in New York sometime around the mid-century. It's big and heavy. It may have been used in a store or shop. This large cast iron scale would look great on your counter, kitchen island or on a long, rustic farmhouse table as a centerpiece. It would go nicely in a white farmhouse kitchen or an industrial, urban décor. This Detecto scale is in excellent vintage condition with minor spots of rust. There is paint loss on one of the plates. Please use your zoom for a good look.